We are fortunate to welcome John Kaites on a regular schedule to minister to us with our other current pastors. 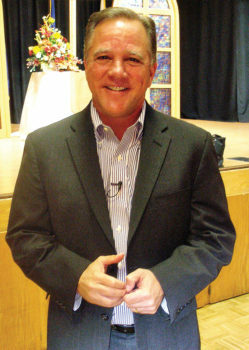 He attended Fuller Theological Seminary and also graduated from Allegheny College and Duquesne University School of Law. Successful in the business area, John was a broadcaster at 16, an attorney at 25, a state representative at 29, started a law firm, had a lobbying firm, and three other companies. John applies the Bible well and is fervent in spreading the word of God. He has a published book, Fear Not … Living Bold into God’s Authentic Confidence, that correlates success in the working world with solid scripture and allowing God to lead the way. Hank Miller has Bible study each Wednesday at 6:30 p.m. in the Hopi Room. All are welcome. Prayer Chain: For prayers, call Julie Hartog at 480-895-2622, jhartog@gmail.com, or Jamie Morgan at 480-802-7358, jamie@sammdata.com. Community Church at SunBird is nondenominational and based on the Bible. Our members invite you to visit us any Sunday at 9:00 a.m. in the SunBird Ballroom. There you will meet our friendly congregation and hear an uplifting message by an experienced minister. Should we save a place? God will be glad to see you.